the railroad station hub- or “terminus” in Atlanta could travel in any direction to any other city or destination of consequence in the South, and indeed to any other populated region of the country touched by the railroad system – hence, Atlanta became known as “The Gate City” of the South. In the late 1850’s, with the population growing rapidly, the city Police and Firemen were few, and if any unusual situation occurred that might tax their ability to maintain security or handle an emergency, there was no fallback. As a result, a number of the most prominent men in the City came together and formed a local militia, not unlike the Minutemen of our Revolution, who would have their own arms and would eventually have a Charter from the State of Georgia granting certain immunities and privileges to its members. This original unit was comprised of 100 Officers and Privates, commanded by Captain George Harvey Thompson, and was officially organized on January 8, 1857. The heart of these volunteers came from the fledgling Atlanta Fire Department. 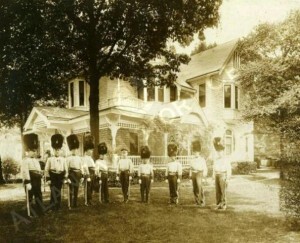 They called themselves “The Gate City Guard”. December 4, 1859. It is also known that the Guard first met on the second floor of the Georgia Railroad Bank building at the corner of Wall and Peachtree Streets, later destroyed by Sherman’s troops as they departed Atlanta for Savannah in November of 1864. In early 1861, Georgia voted with other Southern states to secede from the Union, and the Guard was the first militia company of the state to offer their services to the Governor, Joe Brown. From this we took the first part of our motto, “First in War…” Traveling to Macon, they joined what was called The First Georgia Regiment. In short order they were sent to Pensacola, Florida, helping to strengthen fortifications at Fort Pickens on Santa Rosa Island. They were then sent to Virginia to participate in the Western Virginia Campaign of 1861, fighting at the Battle of Laurel Hill, and later in the Cheat Mountain Campaign under General Robert E. Lee. In early 1862, the Guard’s original enlistment period with the Confederate Army of 12 months expired. However, many of these same men subsequently joined other Confederate units and served with distinction until the end of hostilities. 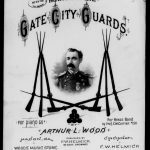 When Reconstruction after the Civil War (The War Between the States) ended and the South was allowed to reconstitute military organizations, The Gate City Guard reformed in Atlanta. The most famous member of the post-war Gate City Guard of Atlanta, and later The Old Guard, was Joseph F. Burke. He was born in Charleston, S.C. in November of 1845, and at the age of 16 was in uniform as a cadet of the Charleston Zosave Corps at the Military Academy of South Carolina, now known as The Citadel, when War broke out with the bombardment of Ft. Sumter. Grady Hospital), served for 20 years as the President of the Atlanta Humane Society, and also served as the President of the Young Men’s Library Association, the forerunner of the Atlanta Public Library. In short, he gave a lifetime of service to his nation, region and community. city lay in ashes at the end of The War Between the States and worse was still to come in the long hard years of military occupation called “Reconstruction”. Passions engendered by the war were slow to subside, but, finally, the American sense of fair play and traditions of law and humanity began to reassert themselves, and in l877lresident Rutherford Hayes withdrew the last federal troops from the South. But the violent antagonisms which had been aroused were still strong. An enduring peace between the sections seemed to require that some positive steps be taken to bring about a permanent reconciliation of North and South. of the reactivated Gate City Guard, led the movement. The Guard had been the first military company in Atlanta to volunteer for the war; now it would be the first to volunteer to secure the peace (“First in War, First in Peace”). country. Its mission was pronounced a great success everywhere and described as the first real move to reunite the states. Soon, veterans of both sides would form the Grand Army of the Republic (GAR) and the United Confederate Veterans (UCV), and these former foes began to meet and recognize they were yet still brothers and Americans, all. remained as “The Gate City Guard”, still subject to state service as militia or National Guardsmen. Atlanta International Cotton Exposition of 1895, entertaining the many visiting units of The Centennial Legion (composed of historic military organizations from the original 13 states) that had hosted them in their home cities and states in 1879.
military units visited by The Guard in 1879 came to Atlanta for this dedication, and it is estimated that 50 to 75,000 people were present for the ceremony, including Mayors of 5 major cities and 5 state Governors. To this day, The Old Guard rededicates this monument every October, and in 201I celebrated the 100th anniversary and re-dedication of this monument. It remains one of our central duties in remembering our past and what The Old Guard stands for – Peace and the reunification of our country after that well known “late unpleasantness”. The Old Guard has hosted many Inaugural Balls for incoming Governors of Georgia as they have taken office. Also, The Old Guard has erected many historical markers around the State, among them several in Atlanta. The Guard has also accumulated a number of historical and valuable military relics over the years, which for some years were on loan to and maintained by the Atlanta History Center. In 201I many of these relics were accepted for permanent display in The Southern Museum in Kennesaw, where the famous locomotive “The General” is housed, for the public to appreciate. appreciation of her traditions and ideals. We thus seek to remember and preserve the very best traditions of the South, Old and New, in chivalry, duty, honor, and patriotism to the United States of America. We honor all our uniformed service men and women, current and past, and in our recognition of the future leaders of these services through the JROTC and ROTC organizations in Atlanta schools and Georgia Colleges and Universities. We are proud to present the Old Guard medal to those young men and women who have excelled in these programs.